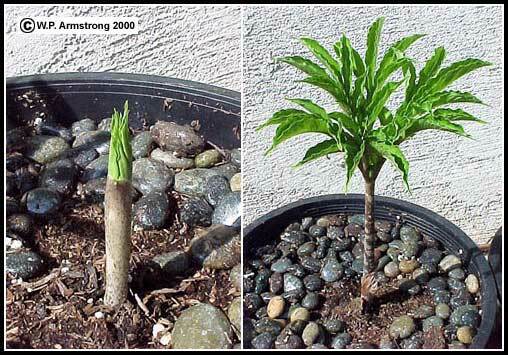 The Malaysian Amorphophallus paeoniifolius developing from an underground tuber. The stages were photographed about one month apart during July and August in southern California. Older references often list this species by its synonym of A. campanulatus. 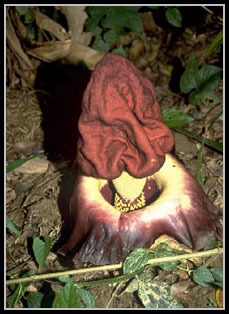 Amorphophallus paeoniifolius from Malaysia. Older references often list this species by its synonym of A. campanulatus. An enlarged, inflated, flower-bearing spadix protrudes from the vase-shaped spathe. The outer rim of the spathe is reflexed and touching the ground. Photo was taken by Kevin Ross in Taman Negara National Park. Tetrastigma voinieranum, a rampant, tendril-bearing vine native to southeastern Asia that is naturalized in the Hawaiian Islands. 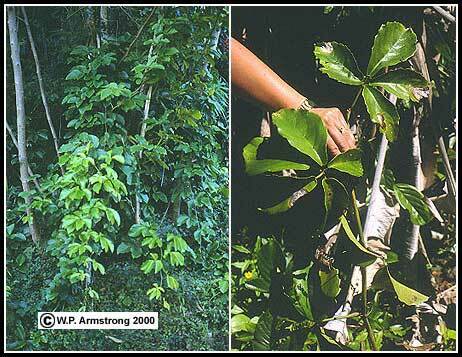 A species of Tetrastigma in Sumatra is the host vine for Rafflesia arnoldii, the world's largest flower. Tetrastigma belongs to the grape family (Vitaceae), along with the North American wild grape (Vitis girdiana) and Virginia creeper (Parthenocissus quinquefolia), and the commonly cultivated boston ivy (P. tricuspitata) of central China and Japan.